Godfrey Higgins was born in 1772, he resided at Skellow Grange near Doncaster, living the life of a comfortable country squire. He was educated at Cambridge and studied law, becoming a Yorkshire magistrate, a Freemason and a reformer, playing a leading role in uncovering the abuse of patients at the York Lunatic Asylum. Higgins wrote the acclaimed Anacalypsis, a book that still manages to be controversial today, dividing historians in the way the work has influenced modern day Theosophy and occultism. The work discusses Higgins’ provocative ideas on a long-lost ancient source for all religions, beliefs, philosophies and the origins of the York Grand Lodge – a must read for all Freemasons interested in philosophy. 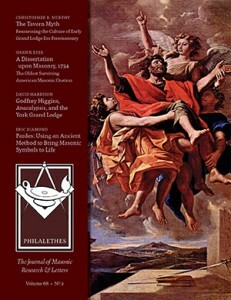 The entire article ‘Godfrey Higgins, Anacalypsis, and the York Grand Lodge’ is available in the Philalethes Masonic Journal, Vol 68, No.2 – Spring 2015.